How do I get my horse lighter and more respectful of the halter? The best way to get a horse lighter on the halter is to start to figure out how you can achieve the same results WITHOUT a halter. Your first step towards this goal will not be completely removing the halter. It does means that when you are working the horse while wearing the halter you must begin to try to achieve a loose rope between you and your horse. 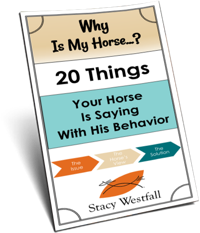 As you begin to think about how to make the lead rope less necessary you will begin to focus more on your body language and being consistent. For example, if your horse tends to pull to the outside of the circle while lunging then you would need to practice inside turns and disengaging the hip. 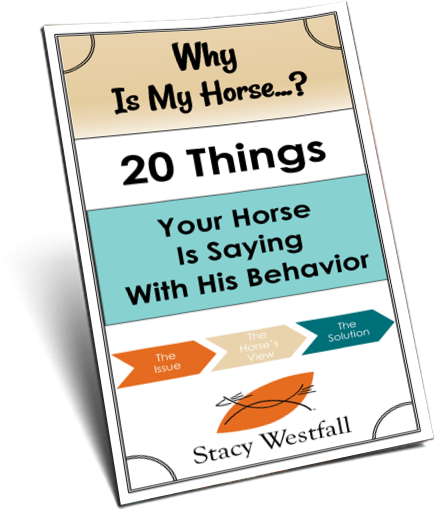 Both of these exercises bring the horses attention back toward you, the handler, on the inside of the circle. If you are trying to get the horse to do an inside turn you might consider taking a step back as your first cue. Your second cue might be switching your stick n string from behind the horse (driving him forward) to in front of your horse (acting as a wall). If the horse still didn’t turn then you would pull on the rope to make contact and pull the horse to the inside. Next you would step your body forward to drive the horse back out onto the circle the other way. Can you see how there were two ‘cues’ before ever pulling on the rope? This gives the horse a chance to read the body language of the handler. When the horse begins to realize that there are more cues than the halter they will often begin to get lighter to the actual halter when it is being used. The change doesn’t happen immediately but when it does it is long lasting. The video below contains an example of giving a horse a chance and then following through. The method I am using of running ahead of the horse (Jac) and then pulling on the halter allows Jac to see what is coming and then make a choice. His choices are wrong in the beginning but eventually he catches on. It is a similar thought process to the inside turn describe above. ← Is head tossing always a horse being resistant?